in September 2016 when he lavished an immense measure of cash to commend his child's birthday.Sadly, he is now in deep financial distress and is asking for assistance from friends and associates. 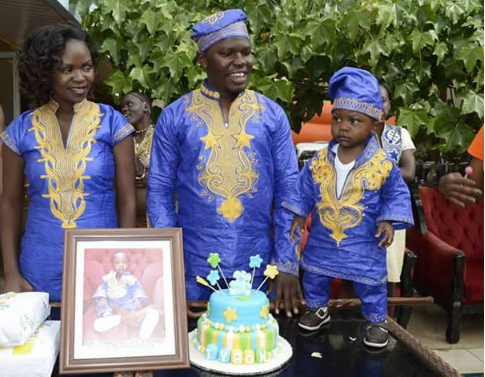 Igbere Tv had learnt that Mr. Owila, a Kenyan, spent KSh 500,000 (over N1.7 million) on his son’s birthday almost three years ago and the celebration featured on local blogs. The extravagant birthday bash went on for three days and had the young boy entertained by traditional dancers while surrounded by heavy security men. But, on March 19, 2019, he was arrested and detained at Kodiago Prisons where he spent the night on Tuesday after he failed to raise KSh 100,000 (over N355,000) bond to secure the release of a friend. The politician had given his motorbike logbook as surety which he later sold, prompting a Kisumu court to order his immediate arrest. His situation became worse when the accused person (his friend) failed to show up for court sessions throughout the period in which the case went on. By close of business on Wednesday, March 20, his family and friends had only raised KSh 70,000. The plea for financial assistance continues as he remains in prison.